China’s mammoth population is 4 times that of the US, and so far, only half of the Chinese people are actively using the internet. With millions moving from China’s rural areas into the cities at record speed, trading coach Jerry Robinson continues last week’s teaching on The Rise of China, and shares 7 Chinese internet stocks (along with their SmartScore Rankings) poised for tremendous profit potential in the long run. As both the S&P 500 and the Dow hit new all-time highs, trading coach Jerry Robinson discusses rising commodities, the decline in the US dollar, and investing in the S&P 500. But first, a reminder of the necessity and importance of good due diligence before trading. Join trading coach Jerry Robinson for a teaching on the first strategic trend we are watching in 2018: The Rise of China. Jerry explains that Americans are woefully uninformed about economic history, and begins today’s session with a brief look at the rise-and-fall history of China. Join trading coach Jerry Robinson for a highly profitable lesson on the use of Bollinger bands in trading to determine a stock’s latest price activity. But first, the schismatic issue of marijuana legalization from a not-so-public Trump perspective. On today’s session, trading coach Jerry Robinson gives members a little taste of our new 2018 Edition of Trends that present opportunities for traders. But first, he reveals market-related news that is highly beneficial and relevant to traders watching the global shift in economic power. In today’s strategy session, trading coach Jerry Robinson shares 3 blockchain ETFs (plus 2 freshly added) that he is following and why. But first, he reports on the profitable success of the option trade that he placed (live) during last week’s Platinum member Mastermind Group session. September is notoriously tough for the U.S. stock market, especially in mid-term years. In response to a member question, trading coach Jerry Robinson examines the performance of the U.S. economy under President Trump using various metrics. As the S&P 500 and the NASDAQ continue their massive rallies with no hint of a pullback anytime soon, trading coach Jerry Robinson charts the markets and answers member questions. Join trading coach Jerry Robinson for an enlightening discussion of President Trump’s public criticism of the Fed, followed by a performance review of S&P sectors. But first, brief highlights of the latest Robinson Report. While supply is currently plentiful and the price is extremely low, trading coach Jerry Robinson explains how preparing for the next major uranium price surge could bring life-changing gains to a trader’s finances. And later, he shares how he is playing the potential rally in the coming months and years. As Turkey’s stock market plummets on President Trump’s announcement that he is doubling metals tariffs on the country, trading coach Jerry Robinson shares significant market-related news, including the ballooning dispute between Saudi Arabia and Canada. And later, he surveys several stocks and ETFs with healthy profit potential, using our proprietary Profit Trakker software. Join trading coach Jerry Robinson for an analysis of the pent-up selling demand in this market and what history has taught us about similar market conditions. Later, he devotes considerable time to answering member questions. Trading coach Jerry Robinson begins today’s session with a brief review of the latest Robinson Report. And later, he highlights the vast and valuable resources available on the Member Dashboard – each just a click away. We may not feel it under our feet, but the data clearly reveals that there is an intensifying global economic shift from the West to the East in a return to the mean. Join trading coach Jerry Robinson as he lays the foundation for potential highly lucrative profits in this changing trend. Join trading coach Jerry Robinson for a review of the latest Robinson Report and later, he shares some stocks and ETFs that he is watching very closely right now. Trading coach Jerry Robinson begins today’s session with a brief look at the staggering GDP growth rate of China (vs. the U.S.), and presents the guidelines he is personally using to navigate the market amid the current trade wars. Later, he explains why small-caps are winning since Trump announced tariffs on China. Join trading coach Jerry Robinson for a review of the Q3 Update to our Crypto Trakker Portfolio, as well as exciting news – the portfolio is up +163% YTD! And later, Jerry informs members of why, when, and what he plans to increase in current portfolio positions. On Wednesday, the EIA announced that nearly 10 million barrels of oil had fallen off the inventory (triple Wall Street’s expectations). Join trading coach Jerry Robinson for an examination of the driving forces behind oil prices right now and seven ways to get in on the action. Private Group Coaching: The Coming Global Semiconductor Bust? As China steps into the ring and plans to produce its own semiconductors by the end of 2019, trading coach Jerry Robinson presents a compelling thesis on the future of the semiconductor industry – and how to profit from it. Join trading coach Jerry Robinson for a performance review of several Follow The Money portfolios year-to-date, and a discussion about a unique trading strategy that has been back-tested and proven to be more profitable than the S&P 500 Index many times – and it’s easy on the brain! Join trading coach Jerry Robinson for the unveiling of our brand new Profit Trakker 2.0 Trend Trading System! This system has been designed especially and exclusively for our Platinum members. Later, Jerry shows members how to create custom views in the software. Trading coach Jerry Robinson begins today’s session with a focus on the powerful vast resources found in our Nightly Trading Alerts for swing traders on the hunt for high potential growth stocks. And later, he provides a demonstration of our proprietary Profit Trakker Trend Trading System and explains how it can help swing traders achieve ultimate trading success. Join trading coach Jerry Robinson for a teaching on the four stages of the probing and pyramiding strategy, which is perhaps the most important skill a trader can learn. Later, mark your calendars… Profit Trakker 2.0 is on track for beta launch June 15, 2018! Trading coach Jerry Robinson begins today’s session by discussing the latest addition to our Position Trading Portfolio, and later, he shares one of his steadfast and highly successful trading rules. Join Trading coach Jerry Robinson for a preview of the exciting new features of our proprietary Profit Trakker 2.0 Software. (Beta launch: June 15, 2018) Also, Jerry introduces Platinum members to a new long-term trading strategy with a 70-80% win rate. Trading coach Jerry Robinson discusses the political pandemonium in Europe, along with its current and potential impact on world markets. Later, he reminds members of the major significance of the pattern in the pause. Private Group Coaching: Iran Drops U.S. Dollar: Guess What Happens Next? 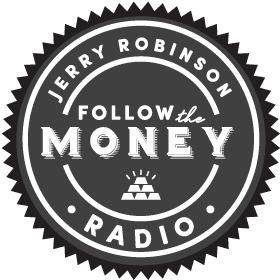 As excitement builds for the 2018 Follow The Money Summit this weekend, trading coach Jerry Robinson briefly discusses the stellar lineup of guests and topics. Later, more bad news for the U.S. dollar, and Jerry shares 6 stocks on his watchlist right now. Join trading coach Jerry Robinson for the highly anticipated unveiling of the itinerary for our 2018 Follow The Money Summit. This year’s theme: Charting the C.O.U.R.S.E. Later, Jerry reviews the recent performance of the S&P 500 and several commodities from our PACE Portfolio. Join trading coach Jerry Robinson for a review of the 3 stocks recently added to the Position Trading Portfolio, as well as the latest Robinson Report. Later, he examines the reasons behind the heightened interest in the rapidly emerging cannabis industry. On the heels of relatively good news on the North Korean front, investor sentiment and the market are on the rise again. Join trading coach Jerry Robinson for a highly beneficial teaching on how to profit from the performance of the IBD 50 with 2 ETFs. As the animal spirits continue to play tug-of-war for control of the market, trading coach Jerry Robinson explains why this is a stock picker’s market. Later, he reveals 3 stocks recently added to our Position Trading Portfolio. Join trading coach Jerry Robinson for a fascinating and highly informative teaching on how to ride the China bull higher without the single-stock risk. Later, he expounds upon the market circuit breakers established by the SEC in the event of a sharp, swift selloff. As the S&P 500 struggles to hold its 200 DMA, trading coach Jerry Robinson reviews market-related news with highlights from our latest Robinson Report, along with an important update on our Cryptocurrency Portfolio. While this grinding sideways market has been brutal for many swing traders, it has been a day trader’s delight. Join trading coach Jerry Robinson for a discussion of trading ideas in this market, and the vital necessity for patience and discipline to achieve success. With the U.S. inflation rate hitting the highest level in a year, trader concern is growing. Join trading coach Jerry Robinson for a discussion of the impact of rising interest rates on the U.S economy. Later, he charts several stocks on his radar and examines recent price excitement in bitcoin. Join trading coach Jerry Robinson for a discussion of the quietly exploding cannabis industry and attractive opportunities for traders to cash in. Later, he shares the impressive roller-coaster price action in bitcoin’s history. As Profit Trakker alerts members to a new Swing uptrend in the S&P 500, trading coach Jerry Robinson charts the markets and shares stocks and ETFs currently on his radar. Later, he discusses recent price movement in cryptocurrencies, along with the promising future for this asset class.